What is the Oregon Bee Project and where did it come from? The origin story of the Oregon Bee Project is an excellent example of Oregonians developing innovative local solutions. Only months after State Representative Reardon (Happy Valley, District 48) assumed office, Oregon experienced a tragic pesticide poisoning of bumble bees in a suburban big-box parking lot in Portland. Although he had been thinking about pollinator health before his election, Rep. Reardon quickly found himself at the lead of an initiative to strike a Pollinator Health Task Force and then a comprehensive House Bill around pollinator health. House Bill 3362 is without equal in the United States and has not only tasked the Oregon State University Extension Service and state agencies to work on pollinator health, but has also committed resources towards carrying out this work. The Oregon Bee Project is a collaborative effort between state agencies and advisory representatives from across the state to develop a statewide strategic plan and build (and connect) programs for bee education, research, management, and more. A statewide strategic plan and website resource will be released later this year. The State of Oregon is doing more than ever to support and maintain Oregon’s bees. Almost 5 years since the bee die off that started it all, Oregon State University Extension Service, Oregon Department of Agriculture, and Oregon Department of Forestry are leading the way thanks to investment from the State Legislature and key stakeholders from around the state. 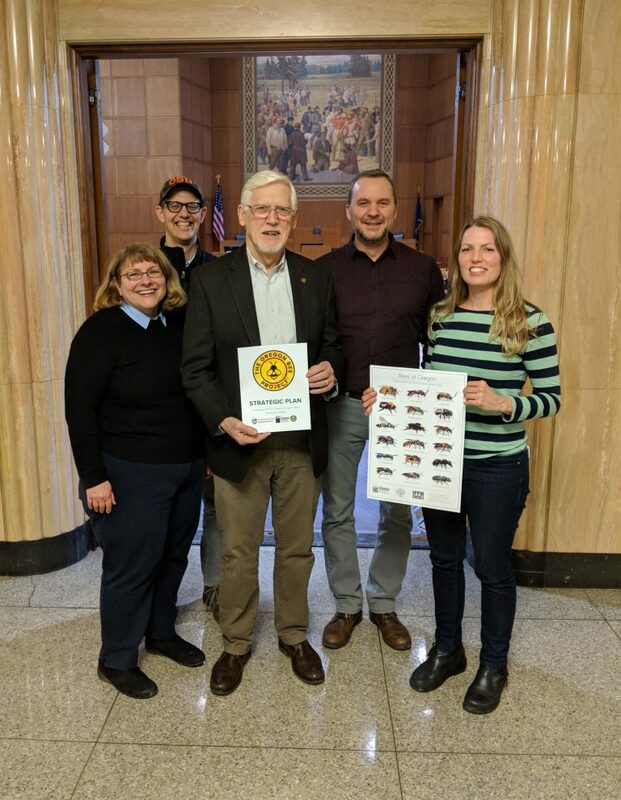 Members of the Oregon Bee Project Coordinating Committee alongside Representative Reardon at the Oregon State Capitol. From left to right: Rose Kachadoorian, ODA, Andony Melathopoulos, OSU, Representative Jeff Reardon, District 48, Clint Burfitt, ODA, and Christine Buhl, ODF.